There will be another Rally to Save TAFE this Thursday 20 September at 12pm at the Treasury Gardens outside the Premier's office. 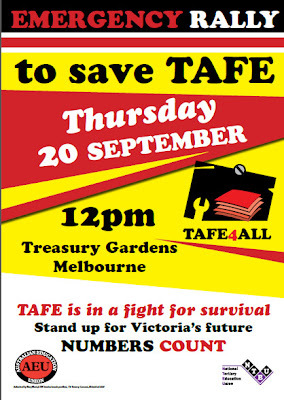 Following reports of documents leaked in The Age last Thursday, TAFE 4 All states, "We are now fighting for the very survival of TAFE in Victoria." The problem has been compounded by today's announcement that the national government is threatening to withhold over $400 million in funding to Victorian TAFEs over the next 5 years, arguing that the Baillieu government's cuts are in breach of the state's COAG (Council of Australian Governments) obligations. In April this year the Victorian government signed onto the Commonwealth's National Agreement for Skills and Workforce Development, agreeing to provide certain levels of funding for TAFEs. Less than 3 weeks later, Victoria announced its plan to cut $300 million from TAFE funding. Today federal Tertiary Education Minister Chris Evans says Victoria's TAFE cuts are "'destroying' the vocational sector and undermining the state's COAG obligations." This news comes just days after TAFE transition plans were leaked to the public. The 86 page document leaked to The Age "reveals deeper cuts than first thought," including "plans for further campus and course closures, steep fee increases, job losses and tens of millions of dollars of asset sales." Whole TAFE campuses under threat of closure include Swinburne's Lilydale and Prahran campuses, Bendigo TAFE's Castlemaine campus, Central Gippsland's Yallourn campus, Kangan's Moreland campus, with still others deemed "at risk". The entire document can be read here. Job losses for 2012-2013 specified in the report number in excess of 1400, although several TAFEs (including Swinburne, which has already reported 240 redundancies) did not report specific numbers. Several TAFEs report tuition fee increases averaging 80% to 100% across the organisation, with Box Hill TAFE indicating an average increase of 100%, with specific course fee hikes ranging from 0% to 593%! The summary of NMIT's proposed transition plan is interesting, naming as part of its overall strategy to "grow enrolments and scale in programs that are dropped by other TAFEs and private providers, where it is economic to do so." NMIT aims to grow delivery in five areas of specialty, one of which is creative arts. Although job losses and course closures are in progress at NMIT also, I'm happy to take this as potentially a good sign for jewellery and visual arts at NMIT! With the federal government's threat of further cuts, though, there's no escaping the fact that we really are fighting for the very survival of TAFE in Victoria. I'll certainly be at Thursday's rally to let Ted "Fail You" Ballieu know we value our TAFE system and expect our government to do the same.